Water/Aqua/Eau, Aloe Barbadensis Leaf Juice, Glycerin, Triticum Vulgare (Wheat) Germ Extract, Saccharomyces Lysate Extract, Sodium Hyaluronate, Panthenol, Niacinamide, Fructose, Glycine, Sodium Lactate, Inositol, Sodium PCA, Sodium Polyacrylate, Gluconolactone, Urea, Sodium Benzoate. Hydrates and calms skin Works with any skin products or makeup Soaks in right away, no breakout Not cheap Small bottle (but you don't need much) Addictive :) Company description: "A highly moisturizing serum for replenishing hydration and brilliance. 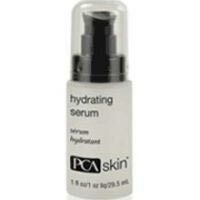 PCA Skin Hydrating Serum - pHaze 43 Includes a slew of hydrating agents, encourages collagen production, softens and conditions skin, decreases inflammation and neutralizes free radicals. Leaves skin younger-looking, healthier and more comfortable"